Santa Pola – Alicante- Spain, June 2018. 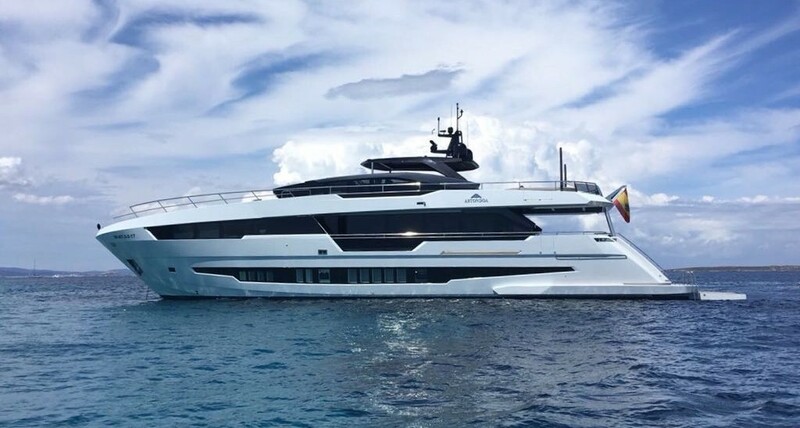 - A new unit of the Astondoa 100 Century is already in production by the Spanish brand in his shipyard of Santa Pola and it´s for the American market. The yacht, whose first unit was officially presented last year at the Cannes Yachting Festival, will be delivered to its owner in 2019. With a length of 30.5 meters and a sleeve of 6.9 meters, the 100 Century incorporates the characteristic inverted hood of the cabin “head of shark” that identifies it, undoubtedly, with the range that belongs, increasing the perception of beauty and hardiness in perfect harmony. With large glazed areas throughout the yacht and a shipowner’s cabin occupying the total sleeve on the main deck and four guests cabins on the lower deck. An high bridge both in its dimensions and in its accesses that allow to pass from bow to stern without to change level and a panoramic view that allow to maintain the privacy thanks to its side windows. Its interior, work of the study Cristiano Gatto Design also in this unit, reaches the maximum degree of customization to reflect the identity and the taste of the shipowner in every detail, creating an amazing environment with solutions that meet the most demanding expectations of Astondoa Shipyard customers.